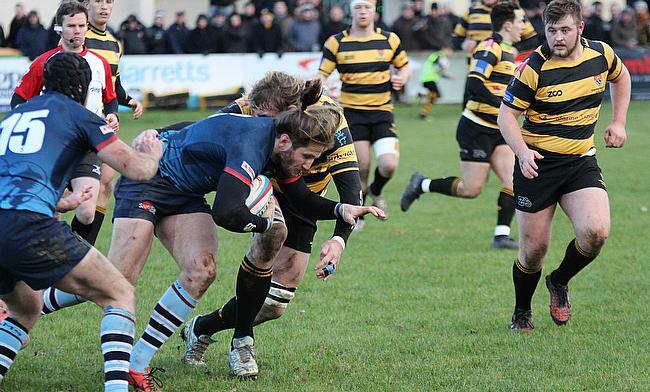 Rams RFC and Canterbury maintained their impressive form in National Two South following victories over Redruth and Old Albanian, respectively. The Rams clinched their ninth consecutive triumph to stay in complete control of the promotion race while a sixth win on the bounce for the City Men keeps them in second sport. Promotion challengers Henley Hawks are on the coattails of the top two after beating London Irish Wild Geese, who remain in the bottom three after this defeat at Hazelwood. Wild Geese’s rivals also failed to win in Round 13 as Birmingham and Solihull lost to Bury St Edmunds while Guernsey were defeated by Dings Crusaders and Old Redcliffians suffered a heavy loss at Taunton Titans. Elsewhere in National Two South, Tonbridge Juddians and Worthing Raiders settled for a draw and Clifton comfortably beat Barnes in the West Country. Rams RFC’s ambitions for promotion from National Two South were strengthen further after securing their ninth successive victory against Redruth. Seb Reynolds’ side remain nine points clear at the summit and the table toppers continued to their exceptional form in Round 13. Tries from Craig Nightingale, Ben Henderson, Louis Wolf, Jack Steadman and Joe Duffelen gave the visitors their 12th win of the campaign. Richard Brown and Sam Stevens both crossed in the first half for Redruth, but it was all they could manage against the rampant league leaders. Canterbury sealed their sixth win on the bounce as they saw off Old Albanian at the Marine Travel Ground. The hosts scored three tries in the opening half, with Charlie Grimes and Oli Best both dotting down to put the City Man 17-0 up at the break. OAs got on the board after half-time, but Royce Cadman went over for the bonus-point to keep Andy Pratt’s side in control. The visitors did grab a second score, but they couldn’t maintain their winning run, as Canterbury held out for the victory which keeps them in the top two. Henley Hawks returned to winning ways in National Two South as they beat London Irish Wild Geese in a convincing manner. Alex Bradley got the ball rolling for the Hawks, but a penalty from Oliver Turner and Scott Moore’s try gave the hosts the lead. However, Ross MacDougall went over for Henley’s second try before the break and after half-time, the visitors cut loose. MacDougall claimed his second before Daniel Barnes and Sam Randal both crossed to put Henley 31-10 ahead. Chris Browne did dot down for the Wild Geese just before the hour, but Scott White’s effort in the final quarter clinched the victory for Henley. After a three straight defeats, Taunton Titans eventually ran out comfortable winners over a spirited Old Redcliffians at the Commsplus Stadium. The Titans went over twice in the first half through Chris Francis and Julian Salvi, but Old Reds rallied as tries from Scott Koster and Henry Bird – as well as a penalty from Kieran Hill – ensured they led 17-14 at the break. However, Taunton went through the gears after the restart as Franics grabbed his second before Oli Rice, Sam Brown and Isaac Dalton all went over for converted scores to seal a welcome victory for Tony Yapp’s side. Tonbridge Juddians missed the chance to extended their winning run to five matches as Worthing Raiders fought back to earn a draw. Jack Maslan and Ben Holt both touched down to give the Raiders a 15-11 lead, with Murray Galbraith-Lowe scoring for TJs along with two penalties from Will Robinson. Rob White rumbled over following a Duncan Tout offload to put the visitors in front with 10 minutes remaining. However, Worthing went on the attack and won a penalty which Matt McLean executed perfectly to grab a share of the spoils at Roundstone Lane. Dings Crusaders ran in six tries to comfortably beat Guernsey and the victory also lifted Luke Arscott’s side into the top half. Guernsey, who are currently in the bottom three of National Two South, were momentarily in front following Dominic Rice’s early try. However, Dings led 14-7 at the break, with Ian Clark and Ashley Challenger going over for the hosts. Before half-time, there was a worrying moment for Guernsey as Alex Gow was transported to hospital after receiving lengthy treatement. Immediately after the interval, the Crusaders turned the screw as Josh Lloyd, Matt Smith and Jordan Grattan all touched down. Malcolm Barnes did get one back for the visitors, but Dings completed the win on 79 minutes as Clark grabbed his second. Hugh Campbell scored two tries as Clifton secured back to back wins against Barnes at Station Road. The hosts were actually 10-3 behind at the break with a Matt Cornish try and a penalty from Josh Hammett putting Barnes in front. Clifton’s Sam Goatley and Nick Van Buuren exchanged tries before the home side began to gain control on proceedings. Campbell and Bentley Halpin crossed either side of a Brad Barnes penalty, but the visitors cut the lead to just one point as Van Buuren went over for his second. But it was in the final 10 minutes where the contest was won as Campbell, Mitchell Spencer and Mark Roberts all dotted down to seal an excellent win for the Gloucestershire outfit. Nick Wakley secured his first win as head coach of Bury St Edmunds, despite having Tuidriva Uru sent off against Birmingham and Solihull. A brilliant first half display from the visitors saw Oliver Watson, Tom Brown, Connor O’Reilly and Ben Leng all cross. Nathan Tisley added to Matt Dight’s first-half try for the hosts and when Uru was dismissed on 61 minutes, the Bees were handed a route back into this contest. However, Pete Glackin’s side couldn’t capitalise on the man advantage as Patrick Robinson immediately crossed for Bury to make it 33-17. The score remained the same in the final quarter as Bury ended a five-game winless run while Birmingham and Solihull sit six points from safety at the foot of the division.